Configure the widget (see configuration) & add it to your sidebar. What HTML should precede the badge items – insert your HTML here, which will be shown above the badges. You can use these * variables. HTML of badge items – insert your HTML, which will be generate for every badge. These ** variables can be used. What HTML should follow the badge items – This HTML will be shown below badges. You can use these * variables. use tags like [TeamName|1] to get team name of your previous team, [TeamRetireDate|2 Y-m-d] for your penultimate team etc. [BadgePictureUrl] – URL of badge picture! WCG – technology solving problems – register & help. [MemberName] is a member of SETI.Germany. Please use the comments for questions and feedback. Thanks. 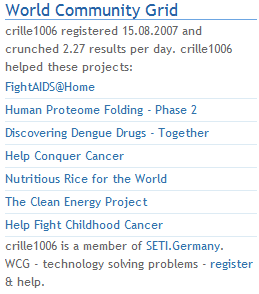 Mit dem World Community Grid-Widget kannst du in der Sidebar deines WordPress-Blogs deine Badges und Statistiken von WCG anzeigen lassen. Die Daten werden 1x pro Tag vom World Community Grid heruntergeladen und aktualisiert. 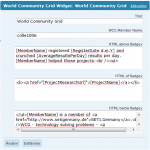 Als Grundlage des Widgets dient diese XML-Datei, die unter http://www.worldcommunitygrid.org/verifyMember.do?name=WCGMemberName&code=YourWCGVerificationCode verfügbar ist. Template – Hier kannst du eine Vorlage wählen, um nicht selber HTML/Code schreiben zu müssen. Wenn du mit der Maus über den Titel gehst, siehst du eine Vorschau des Templates. HTML of badge items – Gebe hier das HTML ein, welches für jeden Badge generiert werden soll. Diese ** Felder/Variablen sind benutzbar. What HTML should follow the badge items – Das HTML, welches unterhalb der Badges angezeigt werden wollen. Diese * Felder/Variablen sind hinterlegt. Um auf ältere Teams deiner Teamhistorie zuzugreifen, musst du solche Tags nutzen: [TeamName|1] ist der Teamname deines vorherigen Teams, [TeamRetireDate|2 Y-m-d] bezieht sich auf das vorvorletzte Team. Bitte benutzt die Kommentar-Funktion für Fragen und Feedback. Danke. First: Just try to reload the page – it seems that the plugin caches old values for $xml_file. I’ll try to output better error messages in version 1.1. This widget is based on this file: http://www.worldcommunitygrid.org/verifyMember.do?name=YourWCGMemberName&code=YourWCGVerificationCode. If you get ‘WCG error: Missing Argument’, it means that something is wrong with YourWCGMemberName or YourWCGVerificationCode. Please tell me, what YourWCGMemberName and YourWCGVerificationCode is. The permission of the wcg_data.xml should be 666. This bug is fixed in version 1.2. Thx Phong for your feedback. Glad to do so, it’s a great widget. I just updated my wordpress to version 2.8, so mayby this is een version problem. I don’t know if it is, but i just want to notify you … so you can fix it in time. Thanks for your feedback. I also updated to WordPress 2.8 and I have no problems with my wcg widget. The missing view() function is in the widget code, but it’s a little bit curious that this function view() is neither called nor defined on line 421. Please do me a favour and delete, download the widget again and reinstall it. Please inform me of the result. I still get the error after reinstalling. I also forgot to mention that putting the widget on the sidebar will give a really odd error. I made a screenshot of it, and placed it here: http://nl.tinypic.com/r/96b53d/5 This behavior showed up when i was dragging the “World Community Grid” widget to the right. I use WordPress 2.8 with a dutch language-pack installed on it. Until now other widgets work fine with me, so i suppose its a related to this one. I have the same behaviour when putting the widget on sidebar. I’ll check it after the NovaRock Festival. Thanks for your reply. PS: On which page do you get the view()-error? In the sidebar or on administration page? I get the error on the sidebar on the frontside. On the administration page it’s only the odd behavior. I have been fiddling around it figured out what the problem is. 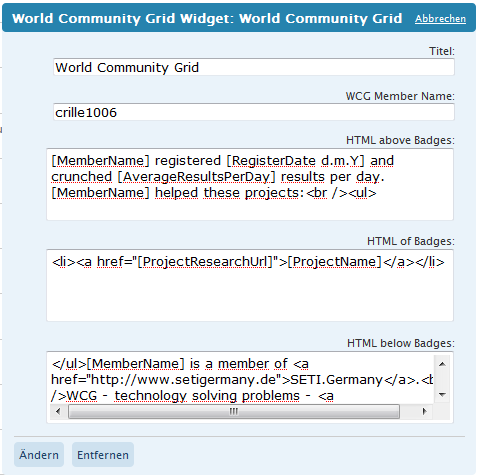 For some reason i don’t have the so called badges in the XML file requested via http://www.worldcommunitygrid.org/verifyMember.do? … really strange but i probably didn’t earn them yet. and ofcours } at 475. For now this will do for me. I hope you can use this info. Thanks for your solution, Winand. I updated the wcg widget to version 2.1. Now, the plugin uses the new WordPress Widget API and I hope everything works, because I had to edit a lot of code. I’m not able to use this plugin under WordPress 3.3.1 (apache2, php5). I can activate the plugin without any problems, but when I try to use the widget and to drag-and-drop-it into my sidebar, it spawns itself. Creating an empty one does not help.